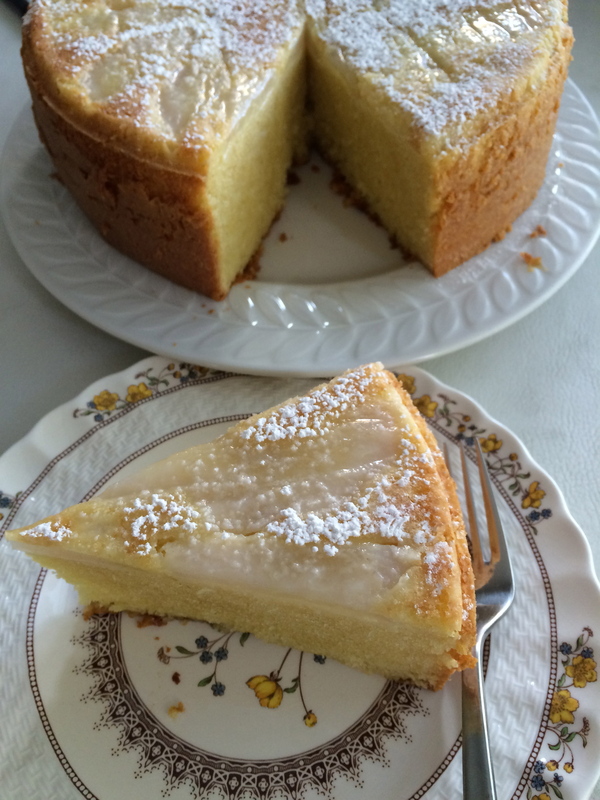 This is from Food 52, and it a version of the almond cake previously posted. I think this is a better recipe as the cake is tall and does not sink in the middle. I think the key to making a perfect cake, without it sinking in the middle, is to have all of the ingredients at room temperature! Preheat the oven to 325° F. Butter a 9-inch cake pan or springform pan, line the bottom with a circle of parchment paper and butter that, too. Dust the pan with flour and shake off any excess. Peel the pears and cut them into very thin slices from stem to bottom. Starting at the outside perimeter of the pan, place the pear slices in tight concentric circles until you’ve covered the pan’s bottom. In a small bowl, whisk together 3/4 cup of cake flour, the baking powder, and the salt. Set aside. In a food processor, grind the sugar, almond paste, and 1/4 cup of the cake flour until the almond paste has mixed with the sugar to form a sand-like substance. With the food processor running, add the cubes of butter one at a time. When the butter has been incorporated, add the vanilla and almond extracts. Process until the batter is smooth and light. Add the eggs one at a time, processing after each addition. Add half of the dry ingredients and pulse a few times. Add the rest of the dry ingredients and pulse the machine until the dry mixture is just incorporated. The batter will be light, fluffy, and thin. Pour the batter over the pears, then bake the cake in the center of the oven. Check it after 50 minutes, at which point in may look like an ominous white blob. Cook it until the top is nicely browned and the center is not too jiggly (mine took 60 minutes in one oven, 70 minutes in another; it has also been known to take 55 minutes. Moral of the story: Watch closely). Remove the cake from the oven and run a sharp knife around the perimeter of the pan to loosen it from the sides. Let the cake cool completely, then invert it onto a cake rack. Invert it once more if you want the pears at the bottom and the crackly, golden-brown side facing up. Dust it with confectioners sugar, then slice a piece for yourself.